The 2015 model year has become one of the flagship models for collectors. With it's ever more powerful Coyote 5.0 liter V8 and a host of improvements, the 2015 diecast Mustang is the perfect addition. The new car brought a host of improvements when it hit the car show circuit. It also hailed the return of the famous "fastback". With it's slick aerodynamic styling and wider track, the new pony car set a new, high standard. 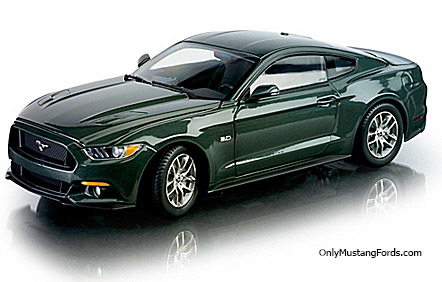 Check out this beautiful dark green 2015 Mustang GT . Ford is still blazing a trail and this highly detailed 1:18 scale GT captures the glory of what many call, the most popular American muscle car in history. This car is fully loaded with authentic detail. Famous 5.0 liter "Coyote" V-8 engine is recreated in exacting detail. This special offering is available in a strict limited edition of only 1,002. Unlike the infamous Mustang ll, which was based on the venerable Ford Pinto, the new chassis was a clean sheet of paper, with an all-new independent rear suspension. This one addition catapulted the car's handling performance deep into exotic car territory, rivaling sports cars with considerably higher price tags. And with nothing less than 300 horsepower and 300 lbs of torque in any engine option, this Mustang finally ended the criticism that any v6 or 4 cylinder dropped into the engine compartment was an insult that turned the iconic car into a dressed up grocery getter.